Today, as part of filling a typical gear hobbing or shaping machine order, engineers are required to perform an SPC acceptance test. This SPC test, while it is contractually necessary for machine acceptance, is not a machine acceptance test. It is a process capability test. It is an acceptance of the machine, cutting tool, workholding fixture, and workpiece as integrated on the cutting machine, using a gear measuring machine, with its work arbor and evaluation software, to measure the acceptance elements of the workpiece. In the process of developing gear trains, it occasionally occurs that the tip of one gear will drag in the fillet of the mating gear. The first reaction may be to assume that the outside diameter of the gear is too large. This article is intended to show that although the gear dimensions follow AGMA guidelines, if the gear is cut with a shaper, the cutting process may not provide sufficient relief in the fillet area and be the cause of the interference. Product announcements so often trumpet minor, incremental advances with works like "revolutionary" and "unique" that even the best thesaurus can fail to offer a fresh alternative to alert the reader when something really innovative and important is introduced. In the case of Mitsubishi's new CNC gear shaper, the ST25CNC, both terms apply. The Shaping Process - A Quick Review of the Working Principle. In the shaping process, cutter and workpiece represent a drive with parallel axes rotating in mesh (generating motion) according to the number of teeth in both cutter and workpiece (Fig. 1), while the cutter reciprocates for the metal removal action (cutting motion). In today's economy, when purchasing a new state-of-the-art gear shaper means a significant capital investment, common sense alone dictates that you develop strategies to get the most for your money. One of the best ways to do this is to take advantage of the sophistication of the machine to make it more than just a single-purpose tool. Up until approximately 1968-69, pinion cutter-type gear shaping machines had changed very little since their conception in the early 1900's. The advent of CNC technology as applied to gear shaping machines has, in the last 10 years, led to an astonishing improvement in both productivity and quality. As is usual when developments such as this take place, the technology of the machine tool suddenly jumps ahead of that of the cutting tool, and the machine is then capable of producing faster than the cutting tool can withstand. Question: When we purchase our first CNC gear hobbing machine, what questions should we ask about the software? What do we need to know to correctly specify the system requirements? Question: We are interested in purchasing our first gear hobbing machine. What questions should we ask the manufacturer, and what do we need to know in order to correctly specify the CNC hardware and software system requirements? Question: We are contemplating purchasing a hobbing machine with dry hobbing capabilities. What do we need to know about the special system requirements for this technology? Gearing for Munchkins Gene Kasten, president of Repair Parts, Inc., of Rockford, IL, is the proud owner of a miniature Barber-Colman hobber, the only one of its kind in the world. The machine, a replica of the old B-C "A" machine, was built between 1933 and 1941 by W. W. Dickover, who devoted 2, 640 hours of his spare time to the project. In today's industrial marketplace, deburring and chamfering are no longer just a matter of cosmetics. The faster speeds at which transmissions run today demand that gear teeth mesh as smoothly and accurately as possible to prevent premature failure. The demand for quieter gears also requires tighter tolerances. 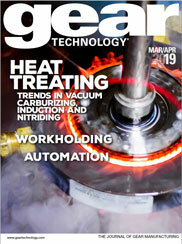 New heat treating practices and other secondary gear operations have placed their own set of demands on manufacturers. Companies that can deburr or chamfer to these newer, more stringent specifications - and still keep costs in line - find themselves with a leg up on their competition. In the quest for ever more exacting and compact commercial gears, precision abrasives are playing a key production role - a role that can shorten cycle time, reduce machining costs and meet growing market demand for such requirements as light weights, high loads, high speed and quiet operation. Used in conjunction with high-quality grinding machines, abrasives can deliver a level of accuracy unmatched by other manufacturing techniques, cost-effectively meeting AGMA gear quality levels in the 12 to 15 range. Thanks to advances in grinding and abrasive technology, machining has become one of the most viable means to grind fast, strong and quiet gears. Power train designs which employ gears with cone angles of approximately 2 degrees to 5 degrees have become quite common. It is difficult, if not impossible, to grind these gears on conventional bevel gear grinding machines. Cylindrical gear grinding machines are better suited for this task. This article will provide an overview of this option and briefly introduce four grinding variation possibilities. New freedom of motion available with CNC generators make possible improving tooth contact on bevel and hypoid gears. Mechanical machines by their nature are inflexible and require a special mechanism for every desired motion. These mechanisms are generally exotic and expensive. As a result, it was not until the introduction of CNC generators that engineers started exploring motion possibilities and their effect on tooth contact. Gear hobbing is a generating process. The term generating refers to the fact that the gear tooth form cut is not the conjugate form of the cutting tool, the hob. During hobbing both the hob and the workpiece rotate in a continuous rotational relationship. During this rotation, the hob is typically fed axially with all the teeth being gradually formed as the tool traverses the work face (see Fig. 1a). Gear grinding is one of the most expensive and least understood aspects of gear manufacturing. But with pressures for reduced noise, higher quality and greater efficiency, gear grinding appears to be on the rise. These days it's hard to get through breakfast without reading or hearing another story about how the computer is changing the way we live, sleep, eat, breathe, make things and do business. The message is that everything is computerized now, or, if it isn't, it will be by next Tuesday at the latest, Well, maybe. Robots, computers and other signs of high technology abounded at IMTS 94, supporting the claim by many that this was one of the best shows ever. Many of the machines on display had so many robotic attachments and computer gizmos that they looked more like they belonged in some science fiction movie than on the floor of a machine shop. NC and CNC machines are at the heart of manufacturing today. They are the state-of-the-art equipment everybody has (or is soon going to get) that promise to lower costs, increase production and turn manufacturers into competitive powerhouses. Like many other high tech devices (such as microwaves and VCRs), lots of people have and use them - even successfully - without really knowing much about how they operate. But upgrading to CNC costs a lot of money, so it's crucial to separate the hype from the reality. Rotary gear honing is a crossed-axis, fine, hard finishing process that uses pressure and abrasive honing tools to remove material along the tooth flanks in order to improve the surface finish (.1-.3 um or 4-12u"Ra), to remove nicks and burrs and to change or correct the tooth geometry. Ultimately, the end results are quieter, stronger and longer lasting gears. By virtue of collected anecdotal accounts, equations and problem solving, balancing is discussed as more math and common sense, and less smoke and mirrors. It’s been said that the best ideas are often someone else's. But with rebuilt, retrofitted, re-controlled or remanufactured machine tools, buyer beware and hold onto your wallet. Sourcing re-work vendors and their services can require just as much homework, if not necessarily dollars, as with just-off-the-showroom-floor machines. Gear shaving is a free-cutting gear finishing operation which removes small amounts of metal from the working surfaces of gear teeth. Its purpose is to correct errors in index, helix angle, tooth profile and eccentricity. The process also improves tooth surface finish and eliminates by means of crowned tooth forms the danger of tooth end load concentrations in service. Previews of manufacturing technology related to gears that will be on display at IMTS 2012. Broaching is a process in which a cutting tool passes over or through a part piece to produce a desired form. A broach removes part material with a series of teeth, each one removing a specified amount of stock. The chamfering and deburring operations on gear teeth have become more important as the automation of gear manufacturing lines in the automotive industry have steadily increased. Quieter gears require more accurate chamfers. This operation also translates into significant coast savings by avoiding costly rework operations. This article discusses the different types of chamfers on gear teeth and outlines manufacturing methods and guidelines to determine chamfer sizes and angles for the product and process engineer. CNC technology offers new opportunities for the manufacture of bevel gears. While traditionally the purchase of a specific machine at the same time determined a particular production system, CNC technology permits the processing of bevel gears using a wide variety of methods. The ideological dispute between "tapered tooth or parallel depth tooth" and "single indexing or continuous indexing" no longer leads to an irreversible fundamental decision. The systems have instead become penetrable, and with existing CNC machines, it is possible to select this or that system according to factual considerations at a later date. The trend toward moving coordinate measuring machines to the shop floor to become an integral part of the manufacturing operations brings real time process control within the reach of many companies. Putting measuring machines on the shop floor, however, subjects them to harsh environmental conditions. Like any measuring system, CMMs are sensitive to any ambient condition that deviates from the "perfect" conditions of the metrology lab. Booth previews from exhibitors showing products and services for the gear industry. High-speed machining using carbide has been used for some decades for milling and turning operations. The intermittent character of the gear cutting process has delayed the use of carbide tools in gear manufacturing. Carbide was found at first to be too brittle for interrupted cutting actions. In the meantime, however, a number of different carbide grades were developed. The first successful studies in carbide hobbing of cylindrical gears were completed during the mid-80s, but still did not lead to a breakthrough in the use of carbide cutting tools for gear production. Since the carbide was quite expensive and the tool life was too short, a TiN-coated, high-speed steel hob was more economical than an uncoated carbide hob. The International Manufacturing Technology Show provided one of the biggest ever marketplaces for buying and selling gear-making equipment, with 121601 attenders, making it the largest IMTS ever. The show took place September 4-11 at McCormick Place in Chicago, IL. Our experts discuss runout and helix accuracy, as well as the maximum number of teeth in a shaper cutter. Economic production is one of the main concerns of any manufacturing facility. In recent years, cost increases and tougher statutory requirements have increasingly made cutting fluids a problematic manufacturing and cost factor in metalworking. Depending on the cutting fluid, production process and supply unit, cutting-fluid costs may account for up to 16% of workpiece cost. In some cases, they exceed tool cost by many times (Ref. 1). The response by manufacturers is to demand techniques for dry machining (Ref. 2). Increased productivity in roughing operations for gear cutting depends mainly on lower production costs in the hobbing process. In addition, certain gears can be manufactured by shaping, which also needs to be taken into account in the search for a more cost-effective form of production. In 1985 a new tooling concept for high volume gear production was introduced to the gear manufacturing industry. Since then this tool, the wafer shaper cutter, has proven itself in scores of applications as a cost-effective, consistent producer of superior quality parts. This report examines the first high-production installation at the plant of a major automotive supplies, where a line of twenty shapers is producing timing chain sprockets. Fred Young, CEO of Forest City Gear, talks about sophisticated gear manufacturing methods and how they can help solve common gear-related problems. It has previously been demonstrated that one gear of an interchangeable series will rotate with another gear of the same series with proper tooth action. It is, therefore, evident that a tooth curve driven in unison with a mating blank, will "generate" in the latter the proper tooth curve to mesh with itself. The forming of gear teeth has traditionally been a time-consuming heavy stock removal operation in which close tooth size, shape, runout and spacing accuracy are required. This is true whether the teeth are finished by a second forming operation or a shaving operation. Machine tool companies are expanding capabilities to better accommodate the changing face of manufacturing. Customers want smaller-sized equipment to take up less valuable floor space, multifunctional machines that can handle a variety of operations and easy set-up changes that offer simplified operation and maintenance. In our last issue, we covered the basic principles of gear shaving and preparation of parts for shaving. In this issue, we will cover shaving methods, design principles and cutter mounting techniques. Q&A with Liebherr's Dr. Alois Mundt. There are a number of companies working to change the way broaching is perceived, and over the past 10 years, they’ve incorporated significant technological changes to make the process more flexible, productive and accurate. The Raso 200 Dynamic has been developed to offer all the characteristics of a gear shaving machine with a competitive price. The objective, according to Dr.- Ing. Hansjörg Geiser, head of development and design for gear machines at Liebherr, was to develop and design a combined turning and hobbing machine in which turning, drilling and hobbing work could be carried out in the same clamping arrangement as the hobbing of the gearings and the subsequent chamfering and deburring processes. Part I of this series focused on gear shaving, while Part II focuses on gear finishing by rolling and honing. There are several methods available for improving the quality of spur and helical gears following the standard roughing operations of hobbing or shaping. Rotary gear shaving and roll-finishing are done in the green or soft state prior to heat treating. The complete Product News section from the May 2009 issue of Gear Technology. A new method for cutting straight bevel gears. Grinding is a technique of finish-machining, utilizing an abrasive wheel. The rotating abrasive wheel, which id generally of special shape or form, when made to bear against a cylindrical shaped workpiece, under a set of specific geometrical relationships, will produce a precision spur or helical gear. In most instances the workpiece will already have gear teeth cut on it by a primary process, such as hobbing or shaping. There are essentially two techniques for grinding gears: form and generation. The basic principles of these techniques, with their advantages and disadvantages, are presented in this section. Liebherr Gear Technology Co. is your North American access point to a broad range of technically advanced gear manufacturing technologies and processes. Headquartered in Farmington Hills, MI, StarCut Sales, Inc. is a wholly owned subsidiary of Star Cutter Company and is a partner in the Star SU LLC enterprise for marketing, sales, and service. Through Star SU and StarCut Sales, Inc.'s international organization Star Cutter Company markets and services its products in North America, South America, Europe and the Far East.